Mercedes-Benz has released an upgraded version of its popular C-Class range with some styling changes at each end; new fully-digital instrument panel and infotainment screen; and a new petrol-electric / hybrid powerplant. The C-Class has been around since 1993 and is arguably the most important vehicle in the Benz range consistently outselling the BMW 3 Series and Audi A4. While this MY2018 update of the fourth-generation W205 was described simply as a facelift by Australian CEO Horst von Sanden there have in fact been significant changes with around half of its 13,000 parts being new. As before the 2018 C-Class comes with four body styles: sedan, wagon (Estate), coupe and cabriolet with prices ranging from $63,400 for a C 200 sedan through to $101,900 for a C 300 Cabriolet. The AMG-enhanced C43 model, also available in the same four variants, was released at the same time as the standard C-Class models. We’ll cover them separately on a story to follow. An AMG C 63 will complete the range when it arrives in early 2019. External changes in the C-Class are focused on the front of the car with new Multibeam LED headlamps, grille and bumper. There are also new taillights. There are also new body colours and wheel designs. The C 200 and C220 d have 18-inch alloys, C 300 gets 19-inch. The more noticeable changes are inside the car with two large screens dominating the dashboard area. Immediately in front of the driver is 12.3-inch digital instrument display and in the centre of the dash is a 10.25-inch media display that can be customised to three different themes. The definition on the media screen is sharp and clear. It’s not a touchscreen but is controlled mainly through the Comand rotary dial on the centre console. The media system allows access to both Apple CarPlay or Android Auto. We found neither the instrument nor media displays to be particularly intuitive and buyers could be in for a fair bit of tuition before getting the hang of the large range of features. But it will be worth it in the long run. Interior space is good with an impressive amount of rear seat both leg and head room. The major change under the bonnet of the C-Class is a new 1.5-litre four-cylinder turbocharged petrol engine in the C 200 models. It has what Benz describes as a ‘mild hybrid’ system. It uses a 48-volt onboard electrical system called EQ Boost that adds 10 kilowatts to the engine’s 135 kW. Importantly that extra power kicks in at low revs and so effectively eliminates any turbo lag. During deceleration the battery gets charged with a dashboard displaying the differing levels of power and charging as conditions change. The EQ Boost system also helps keep fuel consumption marginally down to a factory tested 6.4 litres per 100 km. The C 200 cannot operate purely on battery power. The other engines in the non-AMG range are a 2.0-litre turbo-diesel in the C 220 d and 2.0-litre turbo-petrol in the C 300. All are rear-wheel drive mated to the Mercedes 9G-TRONIC nine-speed automatic transmission. All-wheel-drive is standard in the AMG C43. Standard safety features on all Benz C-Class models include nine airbags; enhanced ABS brakes; Adaptive Brake with Hold function, brake drying and hill hold; Electronic Stability Control with acceleration skid control; Blind Spot Assist; tyre pressure warning; and Pre-Safe crash anticipatory system. The C 300 adds a Driving Assistance Package that includes Active Distance Assist; Active Brake Assist with cross-traffic function; Evasive Steering Assist; Active Blind Spot Assist; Active Lane Keeping Assist and Pre-Safe Plus. 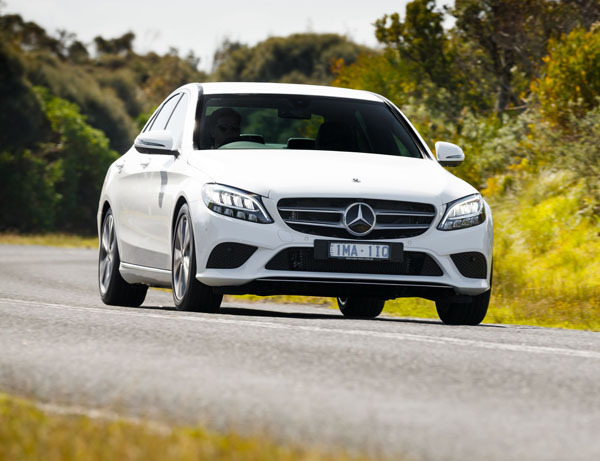 The route chosen for the C-Class launch drive program covered a total of around 600 kilometres from Tullamarine airport to Milawa in the north-east of Victoria, with a minimal level of urban or motorway. We drove the C 200 Estate on the outward trip and the AMG C 43 sedan on the way back. The AMG took a 100 km alternative route with some mildly challenging hills and bends which we’ll report on in our follow-up report but otherwise there was very little along the route of predominantly straight and curvaceous roads. 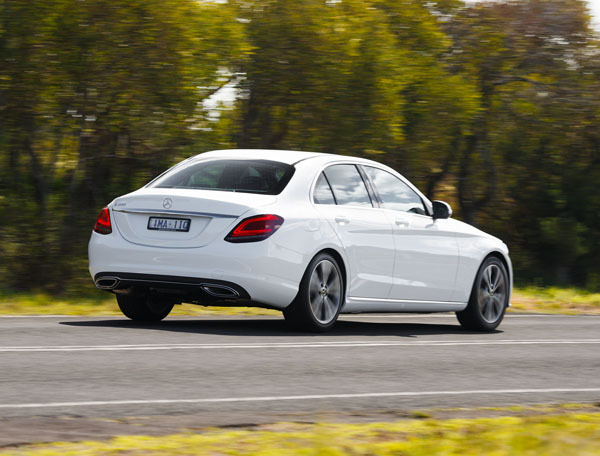 The C 200 cruised comfortably and quietly throughout. Overtaking on the few occasions that it was required clearly showed the benefit of almost immediate torque supplied by the EQ Boost with a minimum amount of time on the wrong side of the road. Ride comfort is very good and the overall feel and sophistication is of a car a full size larger. Noise and vibration are well controlled and even on harsh Australian backroads there’s very little intrusion into the cabin.